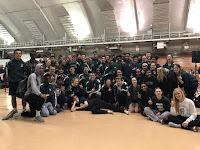 Thursday night the Madison Memorial track & field team braved the elements to take part in our second dual of the outdoor season. We are becoming used to practicing and competing in the rain and wind. As coaches we loved seeing the competitive fire in many of the athletes who competed in the not so ideal weather conditions. This competitiveness and hard work will pay off once the weather turns nice (or should we say IF the weather turns nice). For the second straight dual meet this season the girls and boys teams were victorious. The girls scored 65 to Middleton's 62 points and the boys scored 70 to Middleton's 57 points. These meets give the coaches a nice picture into our abilities for the rest of the season and prepare us to compete our best at the invitationals and championship meets that lie ahead on the schedule. The conference championships is less then 4 weeks away...will you be ready to run your best? GIRLS- 4x800 in 10:53.6 (Sara N, Sienna C, Kelsey K, Meghan S), 100m dash by Sarah H in 13.7, 300m hurdles by Mariah O-F in 51.3, 200m dash by Sydney S in 29.8, 4x400 in 4:36.5 (Mariah O-F, Sydney S, Sarah H, Emma Cate M.), Triple Jump by Danni S in 29' 10", and Shot Put by Corinne F in 32' 5"
BOYS- 110m hurldes by Daurice F in 14.7, 100m dash by Jester W in 10.9, 1600m run by Tyler M in 4:53.0, 4x100 in 47.8 (Jake A, Josh B, Ben I, RaQuan C), 300m hurdles by Daurice F in 41.1, 200m dash by Jester W in 23.4, 3200m run by Hans H in 11:05.3, Long Jump by Daurice F in 20' 11", Triple Jump by Micah P in 41' 4", and Shot Put by Zach D in 38' 5"